Ousted South Korean President Park Geun-hye has been arrested and taken into custody over a corruption scandal that led to her dismissal. 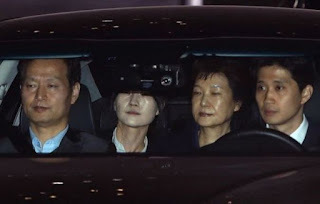 The 65-year-old was driven to a detention centre south of Seoul after a court approved her arrest.She is accused of allowing her close friend Choi Soon-sil to extort money from companies, including Samsung, in return for political favours. Park, who was removed from office earlier this month, denies the claims. The Seoul Central District Court earlier issued a warrant to detain Park while she is investigated on charges of bribery, abuse of authority, coercion and leaking government secrets. It followed a nearly nine-hour court hearing on Thursday that Park attended. 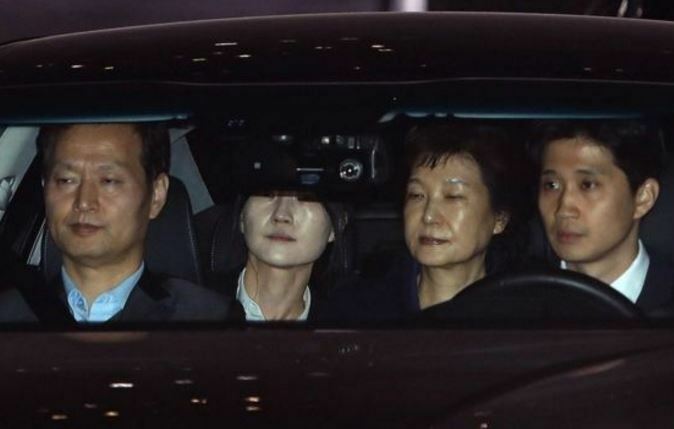 “It is justifiable and necessary to arrest [Park] as key charges were justified and there is risk of evidence being destroyed,” the Court said in a statement. Despite the early hour, some 50 supporters, waving national flags and demanding her release, were at the gate to greet her, the AFP news agency reports. Park can be held for up to 20 days before being formally charged. If convicted she could face more than 10 years in prison. Park lost her Presidential immunity and was dismissed from her post when the Constitutional Court upheld a decision by Parliament in December to impeach her. Park is alleged to have been personally involved in this, and to have given Choi unacceptable levels of access to official documents. Judges had said the former President had broken the law by allowing Choi to meddle in state affairs, and had breached guidelines on official secrets by leaking numerous documents. Choi and Samsung’s acting head Lee Jae-yong, also involved in the scandal, are being held in the same detention centre to where Park has been sent. They are also being tried separately. Hwang Kyo-ahn, who is loyal to Park, is now the acting President and an election is to be held by 9 May.